For better or worse, this CD is no longer available. Like the Congolese and Kenyan CDs on my African Acoustic page, it was dubbed from commercial recordings and I was offering it simply as a stop-gap until somebody issued a proper CD from the session tapes. The owners' representative has now written and complained, so I am removing it. There is a similar set available as a download from Amazon UK, but unfortunately it cannot be ordered from the US. Meanwhile, I have posted a couple of blog entries and videos related to Blake, featuring my versions of "Jones, Oh Jones" and "Yas, Yas, Yas." Blake Alphonso Higgs was the other Blind Blake--I assume his nom de guerre was in emulation of the blues guitarist, but it may just be coincidence. For many years he fronted the house band at the Royal Victoria Hotel in Nassau. His music was a unique mix of old island favorites, more recent calypso compositions, and a quirky grab-bag of minstrel songs and ballads from the United States. 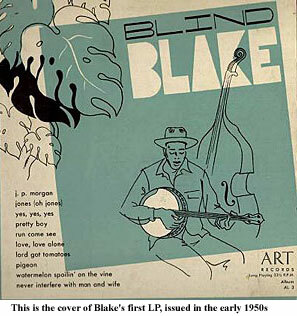 Minstrelsy was an especially important element of Blake's work, evident both in his choice of the banjo and songs like "Watermelon Spoilin' On the Vine," "You Shall Be Free," and "J.P. Morgan" ("My Name Is Morgan, But it Ain't J.P."). Blake has none of the self-conscious dialect and overdone comedy that was typical of the minstrel genre, though, and his sidemen combined the jazzy guitar licks and harmonies of groups like the Ink Spots with West Indian rhythms, with the result that his recordings have an easy humor and swing that few musicians from any continent can match. This CD is drawn from a series of recordings made in the early 1950s, whose popularity with tourists led to them being widely heard in the US, and imitated by many early folk revival musicians. Johnny Cash's notorious rewrite of "Delia," for example, almost certainly comes via Josh White's cover of Blake's recording, and he was also the source for Dave Van Ronk's "Yas, Yas, Yas," Paul Geremia's "Jones (Oh Jones)," and "Run, Come See Jerusalem," which was done by dozens of groups--and that's not to mention his influence on Harry Belafonte. All of which being said, it is kind of silly to applaud Blake as a source for other artists, since none of them ever bettered his versions, and few even came close.